An ex vivo preparation is described for isolation of the largest gracilis muscle resistance arterioles for interrogation of both vascular responses to vasoactive stimuli and the assessment of basic structural properties via passive wall mechanics. Butcher, J. T., Goodwill, A. G., Frisbee, J. C. The ex vivo Isolated Skeletal Microvessel Preparation for Investigation of Vascular Reactivity. J. Vis. Exp. (62), e3674, doi:10.3791/3674 (2012). The isolated microvessel preparation is an ex vivo preparation that allows for examination of the different contributions of factors that control vessel diameter, and thus, perfusion resistance1-5. This is a classic experimental preparation that was, in large measure, initially described by Uchida et al.15 several decades ago. This initial description provided the basis for the techniques that was extensively modified and enhanced, primarily in the laboratory of Dr. Brian Duling at the University of Virginia6-8, and we present a current approach in the following pages. This preparation will specifically refer to the gracilis arteriole in a rat as the microvessel of choice, but the basic preparation can readily be applied to vessels isolated from nearly any other tissue or organ across species9-13. Mechanical (i.e., dimensional) changes in the isolated microvessels can easily be evaluated in response to a broad array of physiological (e.g., hypoxia, intravascular pressure, or shear) or pharmacological challenges, and can provide insight into mechanistic elements comprising integrated responses in an intact, although ex vivo, tissue. The significance of this method is that it allows for facile manipulation of the influences on the integrated regulation of microvessel diameter, while also allowing for the control of many of the contributions from other sources, including intravascular pressure (myogenic), autonomic innervation, hemodynamic (e.g., shear stress), endothelial dependent or independent stimuli, hormonal, and parenchymal influences, to provide a partial list. Under appropriate experimental conditions and with appropriate goals, this can serve as an advantage over in vivo or in situ tissue/organ preparations, which do not readily allow for the facile control of broader systemic variables. The major limitation of this preparation is essentially the consequence of its strengths. By definition, the behavior of these vessels is being studied under conditions where many of the most significant contributors to the regulation of vascular resistance have been removed, including neural, humoral, metabolic, etc. As such, the investigator is cautioned to avoid over-interpretation and extrapolation of the data that are collected utilizing this preparation. The other significant area of concern with regard to this preparation is that it can be very easy to damage cellular components such as the endothelial lining or the vascular smooth muscle, such that variable source of error can be introduced. It is strongly recommended that the individual investigator utilize appropriate measurements to ensure the quality of the preparation, both at the initiation of the experiment and periodically throughout the course of a protocol. Prior to the experiment day, glass capillary tubes of the appropriate dimensions for the station are pulled into micropipettes (either a horizontal or vertical puller can be used). The tip diameter can be readily adjusted depending on the vessel being isolated, although we generally use a diameter range between 50-150 μm. These are then bent to the appropriate configuration for the microvessel station following heating over a butane flame. Micropipette tips are physically broken to the approximate diameter (with fine forceps) for the microvessel in question and can ground or polished to the appropriate conformations, as necessary for the specific application. For an extensive and outstanding review on these procedures, the reader is directed to Davis et al.16. Two micropipettes are then placed in opposition into the pipette holders for the microvessel chamber. These must be oriented such that the tips are in the same vertical and horizontal plane within the vessel chamber. The microvessel chamber used in this manuscript (Figures 1 and 2) is one that is custom built by Mr. David Eick in the Department of Physiology at the Medical College of Wisconsin (http://www.phys.mcw.edu/ and www.eicktech.com). However, several other configurations of microvessel chamber are readily commercially available, with those developed by Living Systems Instrumentation (http://www.livingsys.com/) and IonOptix (http://www.ionoptix.com/) being very common. Using these other systems, it may be imperative to utilize an inverted microscope rather than a conventional upright one, although this is dependent on the specific experiment and equipment requirements. The use of inverted microscopes would be preferable for experimental protocols requiring fluorescent or confocal imaging. Prepare a physiological salt solution (PSS; outlined below) and ensure pH is set to appropriate levels for the specific experimental conditions (7.38-7.42 is typical and falls within physiological range). The PSS solution may be prepared beforehand and refrigerated but must be checked at the appropriate temperature for pH prior to use. PSS can contain albumin if the experimenter or specific protocols requires it, although this is not universally mandatory. The digital video calipers used to measure vessel diameter should be calibrated using a hemocytometer or microscope stage micrometer. For accurate calibration, it is vital that the micrometer be placed in the same plane as the inflow/outflow micropipettes in the vessel chamber. Tie loops for attaching the microvessel to the pipettes should be prepared and be readily accessible for subsequent use. These can readily be prepared from 8-0 or smaller ophthalmic suture. The single tie loop can be prepared beforehand and stored in a covered Petri dish on a small strip of reversed tape surrounding a microscope slide until needed (this will keep them from being lost). (Figure 3). All supporting equipment should be turned on and checked for proper function. This includes the anti-vibration/floating table and the circulating heated water bath (set to provide the appropriate temperature in the vessel bath - commonly 37 °C), all pressure transducers and the vessel chamber drain pump (Figure 1A and 1B). Turn on the equilibration gases in the vessel chamber and in the perfusate and superfusate reservoirs. Fill all of the reservoirs, tubes, and chambers with the PSS solution. The perfusate line leading to the inflow pipette must be completely filled to avoid the presence of air bubbles in this line which could dislodge and damage the vascular endothelium (Figure 1C). If needed, use a syringe to gently push the PSS all the way through the pipette to insure that it is completely full and without any blockage that could impede perfusate flow. The inflow pressure should be kept within reasonable limits to avoid damaging the pressure transducers. Following anesthetizing of the animal from which the microvessel is to be taken, the vessel in question should be isolated according to the procedures that are most appropriate to the vasculature to be studied. In some cases, this may require removal of the organ itself (e.g., cerebral or coronary microvessels), while in others, vessels can be removed directly from the anesthetized animal (e.g., muscle). An example of the orientation of the vessel within the gracilis muscle is presented in Figure 4. Estimate the length of the vessel in vivo prior to removal with forceps or small calipers. Prior to removal of the vessel from the animal/organ, it can be very helpful to perform one final check to make certain that the vessel chamber is ready and functioning properly (including all tie loops in place). Remove the vessel from the animal/organ by grasping the exterior side of the vessel at one end with fine forceps and cutting along the length of the vessel until it is free, taking extreme care to avoid any tugging or pulling on the vessel. Once freed, immediately place it in a 1.7 mL centrifuge tube filled with PSS but do not let go of the vessel. This is to remember the orientation, such that perfusate direction in the bath will be identical to blood flow direction in the animal. Place the vessel in the filled bath and cannulate the proximal end on the inflow pipette. This can best be accomplished with a modest perfusion rate through the cannula (~50 mmHg pressure) and a pair of fine forceps used to hold each side of the proximal vessel lumen wall (i.e., one pair of forceps in each hand). In our laboratory, we use fine forceps from Fine Science Tools (http://www.finescience.com/Home.aspx), although any appropriately constructed forceps will work effectively. Slip the vessel on the cannula tips and advance the vessel on the tip to the point where two tie loops can secure the vessel. Raise the inflow pressure to ~75 mmHg to further inflate the vessel and facilitate cannulation on the distal pipette tip. Flow through the vessel should be seen as a distortion in the superfusate reservoir at the distal outflow of the vessel (under the microscope). Cannulate the distal end of the vessel on the outflow pipette and secure it with two tie loops (these final loops must be in place prior to the cannulation; Figure 5). Adjust the cannula until in the XYZ coordinates as needed until there is minimal distortion in the vessel, and the vessel approximates the in vivo length. Raise the inflow pressure until it is approximates the percentage of mean arterial pressure normally experienced by that vessel segment (our laboratory utilizes 80% of mean arterial pressure for the large resistance arterioles of the gracilis muscle8). Place a small bubbling stone delivering the appropriate gas mixture into bath and place plastic wrap or a glass cover over the chamber to avoid splashing the microscope lens. We use a bubbling stone that is commonly available at all pet/aquarium stores and is approximately 1 cm in diameter, although a smaller size will work effectively as well. The presence of the bubbling stone insures appropriate gas availability to the vessel at all times and will extend vessel viability. This stone is removed during all measurement periods (or air flow through the stone temporarily interrupted) to prevent distortion of the image. Release the clamp on the outflow pipette and allow flow through the vessel for 30 minutes. Periodically, the flow should be clamped at the outflow tubing to determine if the vessel is developing resting tone. All vessels must be checked for pressure leaks at this point. Leaks will be evident by introducing a known pressure into the vessel (we commonly use 100-120 mmHg) and clamping the outflow, followed by the inflow, lines. If the intraluminal pressure is stable, there are no discernible leaks. However, if pressure begins to fall, a significant leak is present and must be closed. Leaks at either the inflow or outflow pipettes can normally be rectified by adding an additional loop tied around the vessel on the pipette. Alternatively, if a vessel has a small side branch that is allowing the leak, this will compromise the ability of the vessel to contain pressure effectively and can introduce an additional source for error. If this leak is identified, it can normally be tied off with a single loop of 10-0 opthalmic suture. Alternatively, a single strand teased from 6-0 suture to make the tie loop is also highly effective. If the leak cannot be identified or cannot be effectively tied off (e.g., there is no trunk to the side branch and simply a hole in the vessel wall), this may result in a premature termination of the experiment and use of an alternate vessel become necessary (this is generally the identical vessel in the other leg - or contralateral side if necessary - of the animal). The vessel should be allowed to equilibrate under no flow conditions for a minimum of 30 minutes. All experiments are conducted under no flow conditions. Once the vessel has developed satisfactory tone and is responsive to the inclusion criteria for the experiment in question, the vessel is ready for subsequent study. Active tone of >30% (calculated as ΔD/ Dmax x 100 , where ΔD is the increase in arteriolar inner wall diameter from the values under the equilibration pressure in response to exposure to Ca2+-free PSS and Dmax is the maximum diameter measured at the equilibration pressure in the Ca2+-free PSS). Myogenic activation (maintenance of, or preferably a reduction in, arteriolar diameter with increased intraluminal pressure) as an index of a viable vascular smooth muscle layer. A viable endothelial lining, as evidenced by a brisk dilator response to acetylcholine (10-6 M in the bath). Additional inclusion criteria can be added to suit the specific experimental protocol as needed, including constrictor responses to adrenergic agonists such as phenylephrine (10-7 M), dilator responses to additional stimuli such as adenosine (10-5 M) or hypoxia (reduction in 0% O2 in the equilibration gas). The following section is an example of a "mock experiment". All required solutions are prepared as appropriate, with attention paid to account the dilution factor of the PSS in the vessel chamber. As an example, for some of our equipment, the volume of the vessel chamber is 20 ml. As such, 20 μl of a 10-2 M stock solution results in an effective concentration of 10-5 M in the vessel chamber bath. Following vessel removal, cannulation, equilibration and validation as described above, the experiment is ready to commence. Specifics such as treatment randomization and effectiveness are experiment specific and would consume excessive space for this effort. As such, these are not included in detail. Initial control responses are determined. For an example physiological stimulus such as myogenic activation (pressure-induced constriction), intralumenal pressure is randomly altered over the desired range, and the vessel is allowed an appropriate period of time to respond (in this case, we would allow a 5-7 minute period). For an example pharmacological stimulus such as challenge with acetylcholine, the drug is added to the back from stock solutions in a random order. In this case, we would normally use a range from 10-9 to 10-5 M in the bath, with washout being defined as a restoration of equilibration diameter. As acetylcholine is a fast acting agent, maximal dilator responses can readily be achieved in only a few seconds. Other agents (such as peptides) can take much longer to elicit a maximal response and this much be taken into account, as well as the time period taken for effective washout. Once control responses have been collected, specific interventions can be imposed on the system, including incubation of the vessel with receptor agonists/antagonists, agents acting at specific ion channels, instigation of altered intraluminal pressure, differences in equilibration gases or pharmacological agents targeted at specific enzymatic systems, to name a few of the most common interventions. After an appropriate time for the intervention to be effective (which should be tested appropriately), a subsequent round of data collection can be initiated. Depending on the specific experimental protocol, subsequent interventions can be imposed on the vessel or the first can be removed (either by washout - when feasible - or simple removal of the physiological challenge). Once the vessel has returned to its equilibration state (which should be verified), subsequent interventions can be applied as needed with additional data collected. This general procedure would be continued until the termination of the experiment or until the quality of the vessel preparation falls below previously determined threshold criteria (e.g., response to an agonist or the ability to develop sufficient active tone). At this point, the experiment is either concluded, or the investigator may wish to collect data that is independent of the reactivity of the isolated vessel (such as mechanics of the vessel wall, which can be conducted using the identical procedure of myogenic activation, just with a vessel lacking all active tone14). Regular cleaning of all of the equipment is essential for removal of salt buildup and the prevention of the growth of any unwanted biological entities. At the end of every experiment day, at a minimum, all lines and chambers are completely flushed of PSS with copious amounts of distilled or de-ionized water and allowed to dry fully. After every 2-3 days of use, a wash with ethyl alcohol is performed as well and the equipment is allowed to dry fully. At the end of each week of consistent use, all lines and chambers are filled with 0.1 M hydrochloric acid, allowed to 'incubate' for 30 minutes and then washed fully with water as above. Finally, at the end of 2-3 weeks of consecutive use, all sections of tubing are replaced with new and the chamber and reservoirs are cleaned with 1.0 M HCl followed by an extensive rinsing with distilled/de-ionized water. If any discoloration of tubing or visual establishment of a growth in the tubing or any element of the chamber/reservoirs, these are either replaced or thoroughly cleaned as appropriate. With regular cleaning and general maintenance, the equipment can last a very long time. At the time of writing, our vessel chambers are all into their 8th or 9th year of routine use and we have experienced no significant difficulty with them. Figure 1A. This figure presents the basic microvessel station setup. A = television for viewing vessel; B = digital calipers; C= syringe for pushing superfusate through inflow pipette as necessary; D = hydrostatic column for changing perfusate inflow pressure; E = microscope; F = microvessel chamber; G = superfusate reservoir; H = pressure monitor (multiple can be added as necessary); I = microvessel chamber drain pump for superfusate; J = equilibration gas mixture tank; K = waste contained (for superfusate); L = circulating water heater; M = anti-vibration/floating table. Figure 1B. 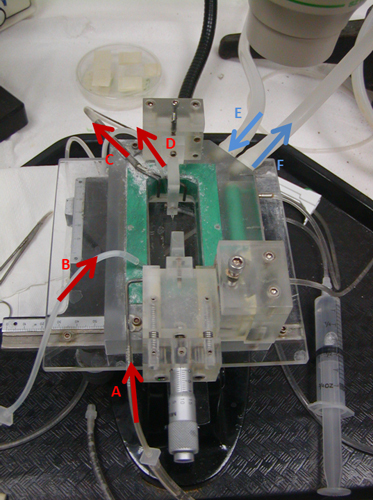 This figure presents a closer view of the microvessel chamber setup. 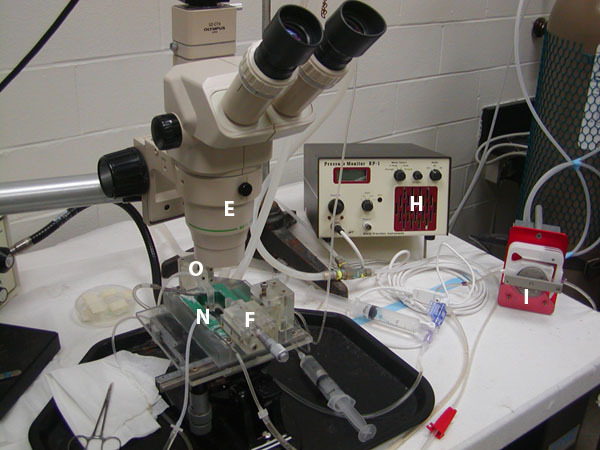 In this figure, E = microscope; F = microvessel chamber; H = pressure monitor (while we show only one for simplicity, multiple can be added to different sites as necessary); I = microvessel chamber drain pump; N = tubing attached to the very beginning of the perfusate inflow pipette (a continuation from 'D' in Figure 1A); O = tubing attached to the perfusate outflow pipette. Figure 1C. This figure presents the closest view of the microvessel chamber. In this figure, N = the perfusate line (i.e., tubing attached directly to the perfusate inflow pipette); O = tubing attached directly to the perfusate outflow pipette; P = the horizontal and vertical location controls for the inflow pipette; Q = the superfusate drain for the water bath (connected to 'I' in Figures 1A and 1B); R = the inflow for the water bath coming from the reservoir (connected to 'G' in Figure 1A). Figure 2. This figure presents a schematic representation of the flow of fluids and gases in the system. In this figure, A = PSS superfusate line inflow; B = PSS perfusate line to inflow pipette; C = PSS superfusate drain from bath to waste container; D = PSS perfusate outflow from outflow pipette; E = heated water input into chamber jacket; F = heated water output from chamber jacket. Figure 3. This figure presents individual tie loops made from ophthalmic suture (viewed through a dissecting microscope with 10x eyepieces and a 4.5x adjustable zoom magnification; Panel A) that are used in our preparation and the storage of multiple tie loops from 8-0 and 10-0 suture on reversed tape around a microscope slide which is stored in a covered Petri dish (to avoid losing them; Panel B). Figure 4. 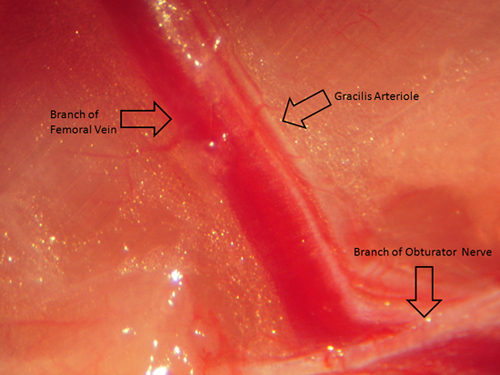 This figure provides an image (viewed through a standard dissecting microscope) of the gracilis muscle resistance arteriole prior to surgical isolation and removal to allow for proper spatial orientation. Figure 5. This figure provides a representative image of a cannulated microvessel. Panel A shows the entire length of the vessel, with both inflow (A) and outflow (B) pipettes as well as tie loops (C) shown. Panel B presents an image at a high magnification, clearly showing the determination of the arteriolar inner diameter with the digital calipers (in this case the diameter is 112 μm). Figure 6. This figure presents representative images of a cannulated microvessel following equilibration. The top image is of a vessel under control, unstimulated conditions at the equilibration pressure, the middle image is of the same vessel following dilation to challenge with acetylcholine (10-6 M in the bath), and the bottom image is of that vessel following constriction to challenge with phenylephrine (10-7 M in the bath). Figure 7. This figure summarizes the responses of an isolated microvessel in response to challenge with: hypoxia (Panel A, a reduction in perfusate and superfusate PO2 in our system from ~135 mmHg to ~40 mmHg), increasing concentrations of acetylcholine (Panel B), changes in intravascular pressure under control conditions and following incubation of the vessel with a calcium-free PSS (Panel C). The protocol presented describes the isolation, removal and double cannulation of a skeletal muscle microvessel, although this general technique can be readily applied to most tissues. For the current manuscript, the term "arteriole" has been used by the authors to describe a resistance vessel ranging between 70-120 μm in diameter under resting active tone, which is also a major contributor to the regulation of perfusion resistance to an organ or tissue. 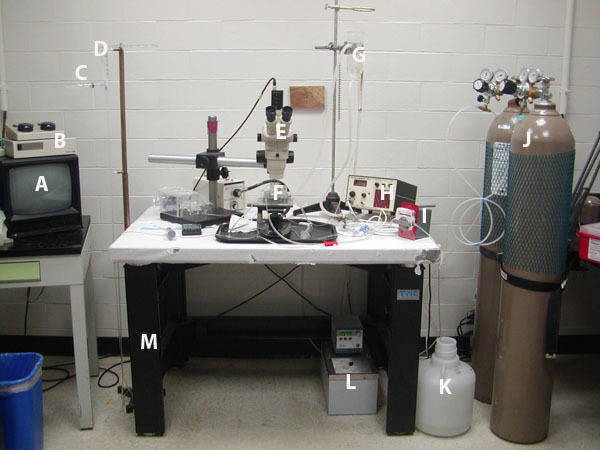 With some modifications, this system can be fitted to multiple applications for the specific investigator and readily allows for the incorporation of additional techniques to provide more in depth experimentation (e.g., use of transmembrane electrodes for determination of membrane potential17). A critical step in the basic preparation is always insuring that the inflow and outflow pipettes that are used to cannulate the vessel are well matched, remain clear, and allow flow and pressure to be maintained in a facile manner. When the pipettes become clogged with minute pieces of debris, it may be necessary to break off very small pieces of the tips to restore flow. If the investigator is careful, pipettes can be reused multiple times until they reach a point where they either cannot be unclogged or the diameters sufficiently large that cannulation of the vessel becomes extremely difficult. However, with mastery of this surgical and experimental preparation, careful attention to detail, and the appropriate modifications to suit specific conditions and requirements, investigators can readily evaluate pathways determining vascular reactivity in response to a myriad of physiological and pharmacological challenges. This preparation will also allow the investigator to perform basic analyses on alterations to vascular wall mechanics under conditions of no active tone14. This is indeed a very powerful and adaptable technique and it is one that can readily be used for applications spanning the range of detailed mechanistic study to high-throughput screenings of more basic responses. This work was supported by the American Heart Association (EIA 0740129N) and NIH T32 HL90610. Goodwill, A. G., Frisbee, S. J., Stapleton, P. A., James, M. E., Frisbee, J. C. Impact of Chronic Anticholesterol Therapy on Development of Microvascular Rarefaction in the Metabolic Syndrome. Microcirculation. 1-18 (2009). Goodwill, A. G., James, M. E., Frisbee, J. C. Increased vascular thromboxane generation impairs dilation of skeletal muscle arterioles of obese Zucker rats with reduced oxygen tension. Am. J. Physiol. Heart Circ. Physiol. 295, H1522-H1528 (2008). Samora, J. B., Frisbee, J. C., Boegehold, M. A. Growth-dependent changes in endothelial factors regulating arteriolar tone. Am. J. Physiol. Heart Circ. Physiol. 292, H207-H214 (2007). Samora, J. B., Frisbee, J. C., Boegehold, M. A. Hydrogen peroxide emerges as a regulator of tone in skeletal muscle arterioles during juvenile growth. Microcirculation. 15, 151-161 (2008). Samora, J. B., Frisbee, J. C., Boegehold, M. A. Increased myogenic responsiveness of skeletal muscle arterioles with juvenile growth. Am. J. Physiol. Heart Circ. Physiol. 294, 2344-2351 (2008). Dacey, R. G., Duling, B. R. A study of rat intracerebral arterioles: methods, morphology, and reactivity. Am. J. Physiol. Heart Circ. Physiol. 243, H598-H606 (1982). Fredricks, K. T., Liu, Y., Lombard, J. H. Response of extraparenchymal resistance arteries of rat skeletal muscle to reduce PO2. Am. J. Physiol. 267, H706-H715 (1994). Durand, M. J., Raffai, G., Weinberg, B. D., Lombard, J. H. Angiotensin-(1-7) and low-dose angiotensin II infusion reverse salt-induced endothelial dysfunction via different mechanisms in rat middle cerebral arteries. Am. J. Physiol. Heart Circ. Physiol. 299, H1024-H1033 (2010). LeBlanc, A. J., Cumpston, J. L., Chen, B. T., Frazer, D., Castranova, V., Nurkiewicz, T. R. Nanoparticle inhalation impairs endothelium-dependent vasodilation in subepicardial arterioles. J. Toxicol. Environ. Health A. 72, 1576-1584 (2009). Jernigan, N. L., LaMarca, B., Speed, J., Galmiche, L., Granger, J. P., Drummond, H. A. Dietary salt enhances benzamil-sensitive component of myogenic constriction in mesenteric arteries. Am. J. Physiol. Heart Circ. Physiol. 294, H409-H420 (2008). Stapleton, P. A., Goodwill, A. G., James, M. E., Frisbee, J. C. Altered mechanisms of endothelium-dependent dilation in skeletal muscle arterioles with genetic hypercholesterolemia. Am. J. Physiol. Regul. Integr. Comp. Physiol. 293, R1110-R1119 (2007). Goodwill, A. G., Stapleton, P. A., James, M. E., d'Audiffret, A. C., Frisbee, J. C. Increased arachidonic acid-induced thromboxane generation impairs skeletal muscle arteriolar dilation with genetic dyslipidemia. Microcirculation. 15, 621-631 (2008). Baumbach, G. L., Hadju, M. A. Mechanics and composition of cerebral arterioles in renal and spontaneously hypertensive rats. Hypertension. 21, 816-826 (1993). Uchida, E., Bohr, D. F., Hoobler, S. W. A method for studying isolated resistance vessel from rabbit mesentery and brain and their responses to drugs. Circ. Res. 4, 525-536 (1967). Davis, M. J., Kuo, L., Chilian, W. M., Muller, J. M. I. solated Chapter 23. Isolated, perfused microvessels. In: Clinically Applied Microcirculation Research. Barker, J. H., Anderson, G. L., Menger, M. D. 32, CRC Press, Inc. 435-456 (1995). Lombard, J. H., Liu, Y., Fredricks, K. T., Bizub, D. M., Roman, R. J., Rusch, N. J. Electrical and mechanical responses of rat middle cerebral arterieal to reduced PO2 and prostacyclin. Am. J. Physiol. 276, H509-H516 (1994).